This standalone data logger measures and stores more than 32,000 temperature readings from a J, K or T-type thermocouple at a resolution of 0.5°C (1°F). It comes supplied with a K-type thermocouple capable of measuring from 0 to 200°C (32 to 392°F). 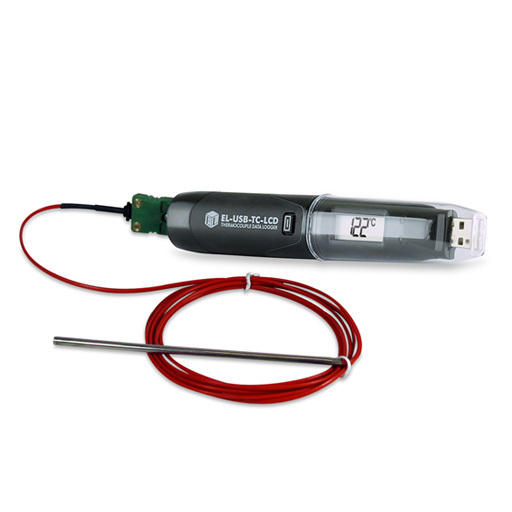 Your application will determine which probe is most suitable based on temperature range, accuracy, form and price. A wide variety of alternative thermocouples are available. The user can easily set up the logger and view downloaded data by plugging the data logger into a PC’s USB port and using the free EasyLog software. Data can then be graphed, printed and exported to other applications for detailed analysis. The high contrast LCD can show a variety of temperature information. At the touch of a button, the user can cycle between the current, maximum and minimum stored values for temperature. The data logger is supplied with a lithium metal battery which typically gives 2 years’ logging life.